Celebrate the holiday season on the day after Thanksgiving at the annual Lighting of the Square event on Friday, November 23. The event will be held on the east steps of the historic Williamson County Courthouse, 710 S. Main Street, in downtown Georgetown. 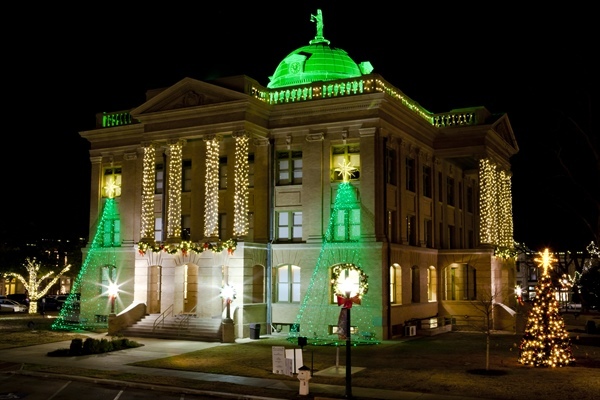 The festivities include entertainment from 5:30 to 6:30 p.m.
Williamson County Judge Dan A. Gattis and Georgetown Mayor Dale Ross will flip the switch illuminating the Courthouse lights and grounds at approximately 6 p.m. The lights around the Square are supported by Georgetown Utility Systems, your community-owned utility making our city 100% renewable. Entertainment during the Lighting of the Square will be provided by the Austin Carolers and refreshments will be provided. Stores will be open until 8 p.m.
Visit The Williamson Museum from 6 p.m. to 8 p.m. and children will be able to make their own Stick Ribbon Tree. Enjoy live music by Evelyn Billington in front of the Museum. This is free and open to the public! Williamson County Brown Santa will offer photos with Santa for a $10 donation in the historic Courthouse after the lighting event from 6:30 to 8 p.m. Enter the courthouse on the south side on 8th Street. Toy donations to Williamson County Brown Santa and the Georgetown Police Department Blue Santa are encouraged. Williamson County Brown Santa and Georgetown Blue Santa have gone paperless for applications. Both organizations will be on the square to accept applications. More information and applications are available at www.wilcobrownsanta.com for Brown Santa or bluesanta.georgetown.org for Blue Santa. For details on holiday events and activities in Georgetown, call the Georgetown Convention & Visitors Bureau at (512) 930-3545, or visit or VisitGeorgetown.com.